A big crowd turned up on Friday evening at The Glen Cowans Photo Gallery and Fremantle Roundhouse for the PROTECT NINGALOO fundraising event. Many artists have donated their works which are on the walls of the gallery, so go and have a look on the weekend. There are some really great works there! There were some speeches and music, drinks and a lovely sunset. It was good to have the fight for the protection of a national nature heritage area in the oldest public building in WA, and it is all about stopping the ridiculous plan to build a 500 hectare gas pipe launch plant at Heron Point and tugs dragging huge steel pipes across the nursery flats of the Ningaloo Marine Park. That madness needs to be stopped because Ningaloo Reef’s health cannot be jeopardised! ONE WEEK TO GO TILL PROTECT NINGALOO SUNDOWNER! Only one week to go till the fund raising Protect Ningaloo sundowner at the Glen Cowans Photo Gallery and Fremantle Roundhouse, so make sure to book your tickets now, as there are only a few left. Comments Off on ONE WEEK TO GO TILL PROTECT NINGALOO SUNDOWNER! Doing a favour for a mate to promote this event, although it’s not in Freo. The Leeming Spartan Cricket Club offers everyone the opportunity to meet with the Premier of Western Australia, Mark McGowan, at our clubhouse on Friday 12th October 2018 for a business breakfast seminar and ninety-minute question and answer session! He will be joined by the Member for Jandakot, Yaz Mubarakai MLA for the session, where locals are encouraged to speak with their state representatives about any topic. Tickets are priced at $100 per person (purchasable by emailing secretary@spartans.com.au), with tables of between eight and ten also available. All proceeds will go towards the Spartans’ one-hundredth anniversary celebrations! A fund raising exhibition at Fremantle’s Kidogo Arthouse, in support of Origins Centre, Balingup is a one-off opportunity of acquiring works by leading Australian artists on sale from the private collection of art curator, Christina McGuinness. STORIES is an exhibition of paintings, prints, sculptures, ceramics and textiles collected from throughout Australia for over thirty years. It’s only on for 3 days. Opens: 6.30pm on Friday 11 May. Last day is Sunday May 13 where the gallery is open from 11am to 5pm. Now Christina wants to share most of her collection while supporting a community that is also very close to her heart and personal well-being. *Origins Centre, Balingup will be gifted the entire net proceeds of the sale in support of their Archival & Restoration Program. There is a big fundraising RECYCLED FASHION SALE on this weekend November 7 and 8 to help rais funds to get an urgently needed shipment of clothing to the people of Monkey Bay in Malawi. All proceeds raised by the Southern Cross Volunteers will go toward the shipment. 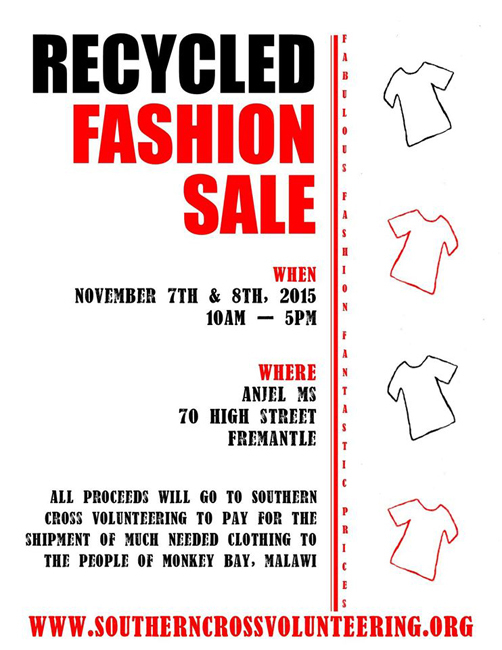 The SALE is on from 10-5 at Anjel MS, 70 High Street, Fremantle, so please buy some clothes and do support it! Fremantle artists John Butler started a project in 2005 to help musicians become self-sustainable and that has grown into Seedfund where his partner Mama Kin is also a director. CLOTHES SWAP FUNDRAISER FOR NEPAL TODAY! 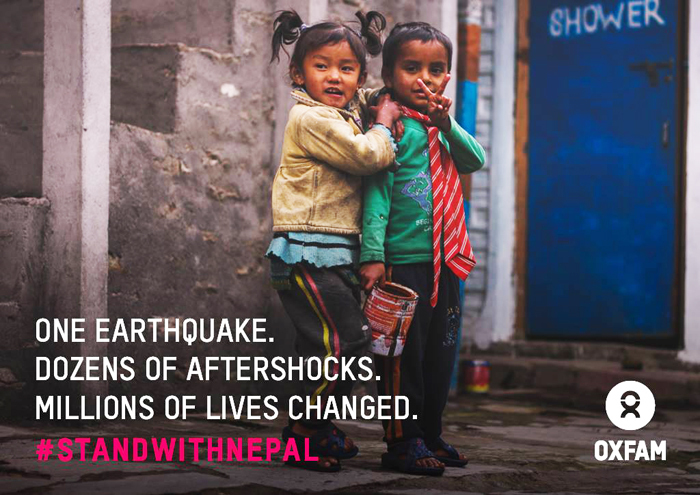 Come and join the CLOTHES SWAP FOR NEPAL at the Drillhall of the Fremantle Notre Dame University TODAY FROM 4-8 PM! Sell clothes, buy clothes, get yourself a whole new wardrobe with great designer labels, or just stock up for the fancy dress parties you are going to be part of. It will be fun with music and funds raised will go to support the earthquake victims and Gyuto monks in Nepal. The Drillhall is at the corner of Croke Lane and Mouat Street near the Esplanade. Comments Off on CLOTHES SWAP FUNDRAISER FOR NEPAL TODAY!